What’s a girl not to like about gold all over the place? This VegasMistress is no different – the graphics aren’t really up to scratch but, the bonus play is fun and keeps my attention. Not a bad little earner for those gold lovers out there! Gold, gold, gold, as far as the eye can see, there is gold. There are factories of gold, the golden master and all manner of things gold. 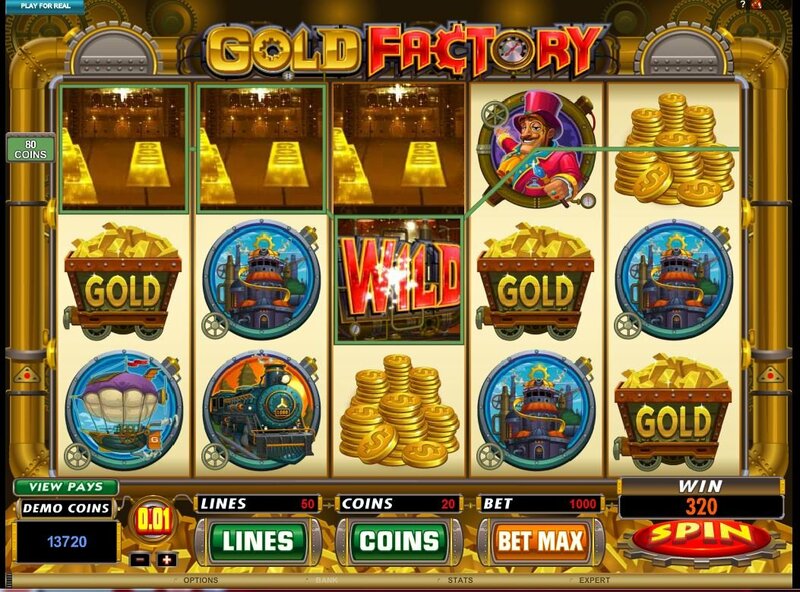 However, is this Microgaming slot game a golden goose? With carts of gold, golden bars and coins, this suave offering does not match the almost carnival style music it comes with. 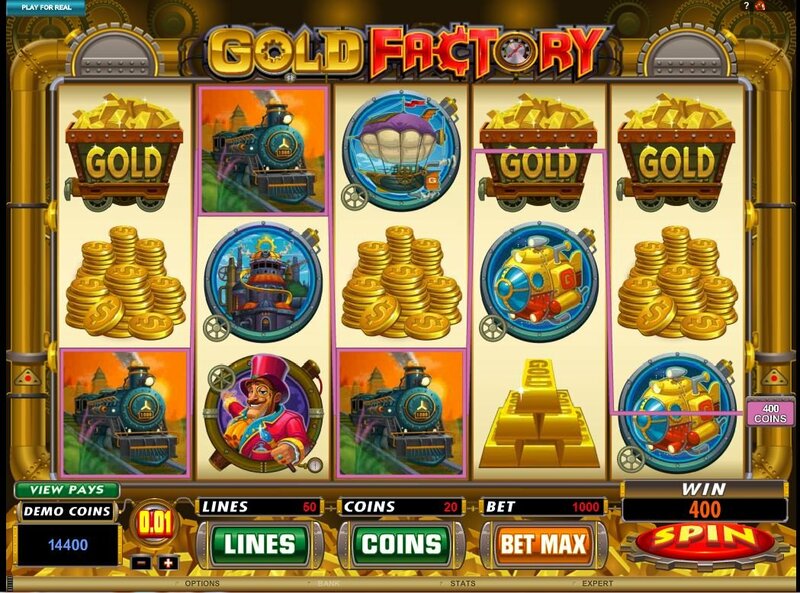 In an ode to the factory part of the slot game, the music is reminisce of a product line in a real factory, churning out its product, in this case, shiny gold for the spinning. 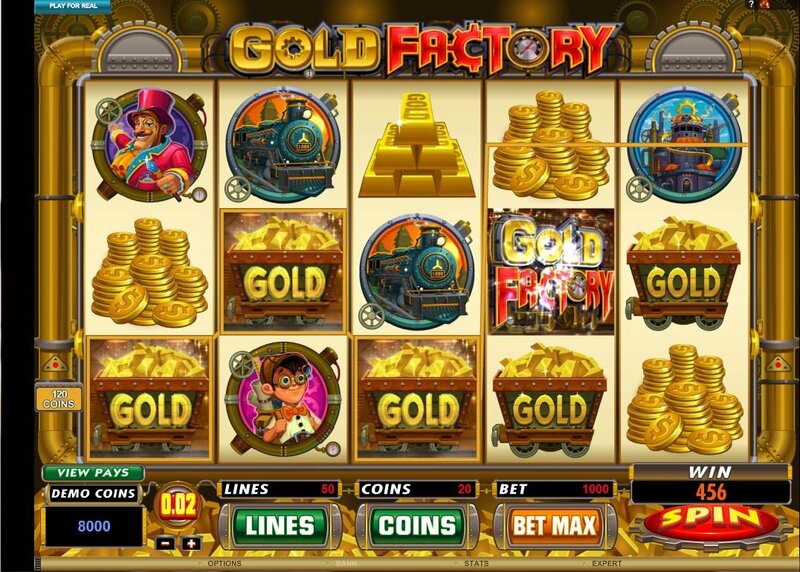 With 50 paylines, you could be in the money with this Gold Factory slot delight. You have your run of the golden mill free spins bonus where you can net yourself between 10 and 35 spins and, all your free spin winnings are doubled up. You can lead yourself to this golden bonus through the boiler room bonus, which I will touch on later in this gold factory review. On a down note, your free spins cannot be retriggered but, your bet-lines and amounts will be the same automatically as the initial spin that netted you the bonus in the first place. With carts of gold, golden bars and coins, this suave offering does not match the almost carnival style music it comes with. Now we come to the Gold Factory Reactor Bonus, also brought to you within that boiler room bonus,. Find a reactor bonus chip and get 12 items to pick from - beware - picking a malfunction will end your bonus play and there are 2 hidden within the 12 items - that’s a 1 in 6 chance you have but, the gold master is almost as nice as us VegasMasters so, you will get a consolation prize for all unselected items die to malfunction! Now, how do we get to the boiler room bonus you may ask? Well, find 3, 4 or 5 gold scatter coins and you will arrive down to the deepest depths of the gold factory floors. Here you will pick 4 out of 12 items to reveal hidden prizes and, you will be able to trigger both of the bonuses from the boiler room floor by hitting the right chips.